Sometime in mid-November, Saturday 17th November in 2018, Christmas lights are put up around the town and a formal switching on ceremony takes place during late afternoon as part of the Christmas Fayre. A Christmas Market with lots of brightly coloured stalls laden with cakes, treats, candles and many tempting goods appears in Trinity Square. Churches and charities often have a stall with fun activities for children. One stall was a great success in 2016, they had a game where children won a soft toy in a gift bag simply by hooking it. Every child received a surprise toy to cuddle. There are usually a number of food stalls selling hot snacks, cakes and drinks which goes down well on a chilly December afternoon. A stage is set up where local dance schools and singers perform to the crowds. Santa and his sleigh are present courtesy of the Rotary Organisation. A mini-funfair with rides for children was held in Market Square that year. The Oakland Hotel provided live music courtesy of ’Frog on a Rocket’. There was entertainment, festive food and a lively atmosphere. 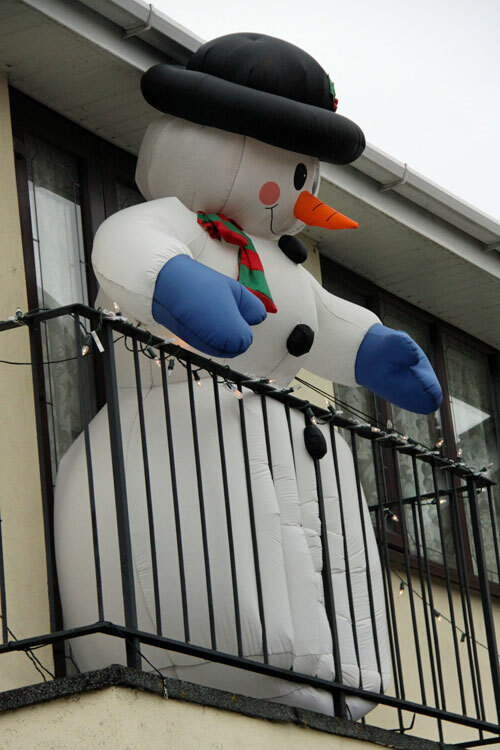 You know that Christmas is on the way when the residents of a house on the corner of Champions Way erect their giant inflatable snowman on the balcony. Various Christmas Fayres and bazaars are held at the schools and Trinity Church. RHS Hyde Hall runs a Christmas gift fayre that brings in the crowds. Meadowcroft Garden Centre just outside the town on the Old Wickford Road holds an annual German Market, complete with bratwurst, sauerkraut and beer. Primary school children sing carols and draw admiring crowds. Their Christmas displays are most festive and it is difficult to leave without a gift or two or a beautiful tree. Father Christmas tours the streets of South Woodham in his sleigh raising money for charity in early December. The various churches hold special Christmas services, carol services and midnight mass. The pubs and restaurants display festive menus and special events. 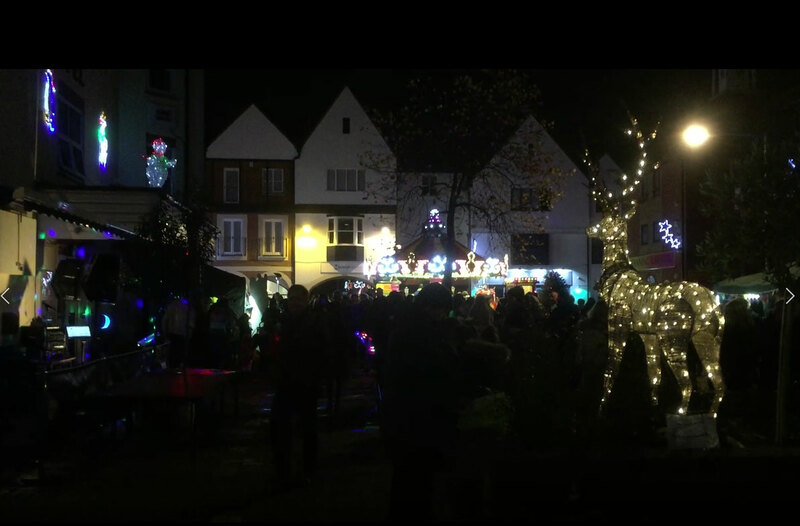 South Woodham residents join in the celebrations with festive lights and decorations in their houses and gardens. There are always some superb houses that are highly decorated and attract people who bring their children to see the colourful lights and moving displays. December is a jolly time in South Woodham Ferrers. The anticipation of Christmas is almost as good as the actual event. A series of festive things to do and see help to make the season magical. Apart from attending organised events, mums and dads may include ‘The Elf on the Shelf’ where a naughty elf creates mayhem for a number of days until Christmas arrives. Mum and Dad then pretend to scold the naughty elves. 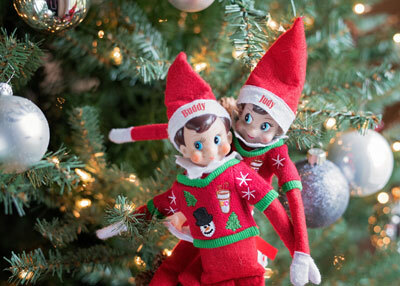 It requires the purchase of an elf or two and these are found in the morning beside their mischievous prank.